In 1598, Ambrosien Vermöllen established Germany’s oldest liqueur factory, which later became famous under the name “Der Lachs” (“The Salmon”). The most well-known concoction, Original Danziger Goldwasser, followed in 1606. The “golden water” with real 22-karat gold leaf quickly advanced to become a drink of the noble society. And so it came about that the Original Danziger Goldwasser became the favourite liqueur of legendary czars Peter the Great and Katherine the Great. The fascination of Original Danziger Goldwasser and the history of the establishment “Der Lachs” persist to this day. But how did the name “Der Lachs” come about? We find the solution to the puzzle in 1704, when the Vermöllen family moves into a new house in a respectable townhouse on located on Breitengasse in Danzig. As was usual back then at this time there we no house numbers but merely a symbol which was engraved above the house door. And at this house the symbol was a salmon. Drinkable gold has lost nothing of its fascination to this day. 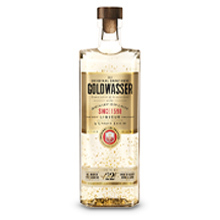 Today “Original Danziger Goldwasser” is still distilled unchanged according to a traditional recipe that is hundreds of years old and is one of the oldest trademarks in Germany.